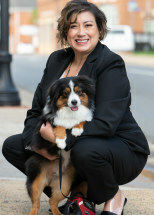 Anna Bristle is a family law and divorce attorney with a practice located in downtown Manassas, Virginia. Anna is known for her dedication to her clients, her hard work and her professionalism both in and out of the courtroom. Anna is creative which makes her a great negotiator. She is passionate about her cases and fighting for her client's rights. Anna develops trusting relationship with her clients and goes the extra mile in working for the best outcome for her clients. Anna represents clients in divorce, child custody, visitation, child support, spousal support and equitable distribution matters in local courts including Alexandria, Arlington, Fairfax, Loudoun County, and Prince William County.